The Ally Hardest Working Dollar Sweepstakes is open only to persons who are a legal resident of one of the fifty United States or the District of Columbia and are 18 years of age or older. 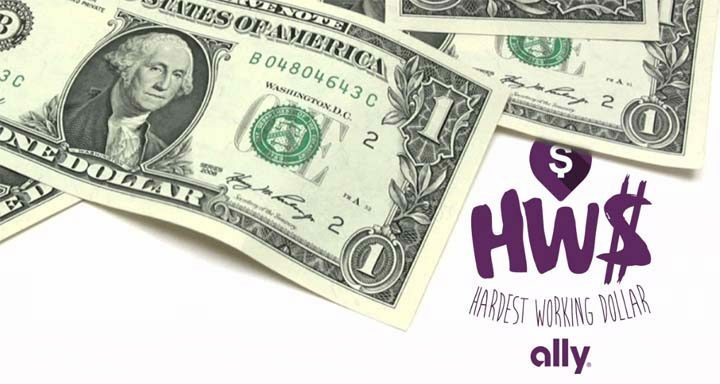 The Ally Hardest Working Dollar Sweepstakes ends at 11:59 p.m. ET on July 31. Online Entry: Entrants who have an Ally Hardest Working Dollar may enter at allyhardestworkingdollar.com. Entry by Mail: To enter by mail, the entrant must legibly print by hand his or her first and last name, e-mail address, mailing address, telephone number, date of birth and the phrase “Ally Hardest Working Dollar Sweepstakes mailed entry” on a 3” x 5” card or piece of paper, and mail it, with proper first-class postage affixed, to Ally Hardest Working Dollar Sweepstakes Mailed Entry, P.O. Box 251328, West Bloomfield, MI 48325. One Grand Prize, six First Prizes and 150 Second Prizes will be offered. The Grand Prize consists of $10,000 USD awarded in the form of a check. The approximate retail value (“ARV”) of the Grand Prize is $10,000 USD. Each First Prize consists of $5,000 USD awarded in the form of a check. The ARV of each First Prize is $5,000 USD. Each Second Prize consists of (i) one Mastercard gift card with a face value of $100 USD, (ii) commission-free trading for a period of 6 months in an Ally Invest Self-Directed Account for equity, ETF and option trades executed by the winner, up to a maximum value of $1,000 worth of commissions, and (iii) a waiver of management fees for a period of 6 months on an Ally Invest Managed Portfolio Account maintained by the winner. The ARV of each Second Prize is $1,117. The aggregate ARV of all prizes is $207,550 USD.